OMEGALUX tubular heaters are used for practically the entire range of electric resistance heating applications. A metal sheath material is selected. The proper size resistance wire for the heating element is carefully selected and verified by computer calculations to ensure the longest service life possible. The high quality resistor wire is carefully tested and inspected to meet rigid specifications prior to being coiled. 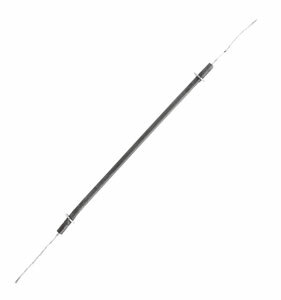 The resistance wire of the tubular heater is then welded to a terminal pin to assure positive connection. The wire is centered in a metal sheath and insulated with high quality magnesium oxide which is highly compacted around it and acts as an electrical insulator. 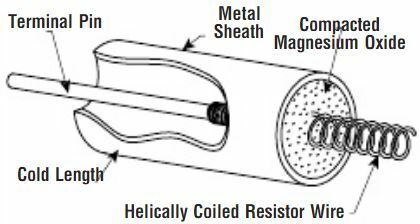 This material readily conducts the heat from the coiled resistor to the metal sheath and puts the heat where it is required, which results in maximum heater life. Highly adaptable, the tubular element, in its many forms and as a component of OMEGALUX packaged heaters and systems, has vastly increased the scale of electric heating applications. The heaters' mechanical and electrical flexibility are important to process engineers and product designers alike, as heating requirements can be matched accurately by proper selection from a great variety of element lengths, sheaths, diameters and watt densities. Electric tubular heating elements provide a method of applying the exact amount of heat required at a specific area. When used with appropriate temperature control, product repeatability is assured. Adding heat to a process often leads to increased production. For example, drying time may be reduced by heating the air or the product being dried. Chemical and cleaning processes are often more efficient when heated and a more consistent finished product results. OMEGALUX quality tubular heaters with properly applied watt density and sheath material will provide long life, less down time and little or no maintenance. For applications like ovens and drying cabinets, tubular heating elements are compact, rugged heat sources. Their formability permits fitting around other oven components and work protrusions, concentrating heat at any point. Compression fittings, factory mounted fittings or brackets will mount a tubular element in a duct or air heating chamber. Tubular heaters listed may be mounted through the side wall of a tank with compression fittings or by factory mounted fittings. The available diameters, lengths, ratings, watt densities, cross-sections, and maximum temperatures provide the solution for a given job. Water and water solutions can generally be heated to any desired temperature. If liquid is under pressure, temperatures should not exceed the maximum sheath temperature of the element minus 100°F. Steel sheath elements can be used for heating oils, heat transfer oils and other solutions not corrosive to steel sheath. Use watt densities compatible with work temperatures. Refer to Technical section of this catalog. Heaters mounted horizontally must be supported to avoid sagging at high temperatures. Proper spacing of supports may vary with application temperature, element diameter and sheath material. Generally 12 to 18" spacing of supports is adequate. Where air flowing over elements permits use of higher watt densities, make sure air flow is evenly distributed. Allow approximately 1/8" per foot of element length for expansion and contraction of elements (i.e., 24" long element could expand 1/4" when energized). Use watt densities compatible with work temperatures. 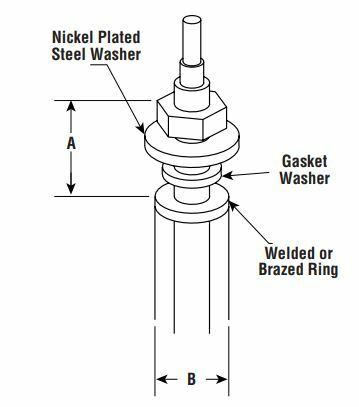 Refer to Application Guide for Tubular Heating of Solids, Liquids, Air & Gas or use curve G-175S in Technical section. Heaters should be clamped tightly for good heat transfer but should be allowed to expand as they heat up. Heaters clamped too tightly will bow away from the heated surface which results in poor heating efficiency and possible heater failure. It is generally best to tighten the middle clamp first to hold the element. Other clamps should be tightened enough to hold, but back off 1/2 turn to allow for expansion and contraction. Heaters should be spaced on approximately two inch centers minimum. Heaters are commonly installed by clamping into machined grooves for better heat transfer. They are also excellent for air heating applications, and Immersion heating with flange, screw-plug, threaded fitting or other means of mounting. Specially constructed to provide excellent service life in radiant heating applications. Standard with threaded clip to facilitate wiring. Retaining Rings locate elements in radiant heater assemblies. For resisting corrosion inherent in the process or environment and for withstanding the sheath temperature required — Standard sheath materials are INCOLOY, steel, copper and stainless steel (type 304). Other types of stainless steel, MONEL, titanium and INCONEL are available. The calculation of total heat requirements for an application is outlined in Technical section. For assistance, contact your Local OMEGALUX field sales engineer who will be glad to contribute his judgement, experience and knowledge in solving your heating problem. After the specific tubular heater size and rating has been tentatively selected, the watt density must be checked against the curves in Technical section. Use more heaters of a lower watt density to obtain the required kW capacity. Reduce the kW capacity needed by reducing heat losses and/or allowing for a longer heat-up time. The watt density of the element, or watts per square inch of element heated area, should be low for heating asphalt, molasses and other thick substances with low heat transferability. It can be higher for heating air, metals, liquids and other heat-conducting materials. See curves in Technical section for determining allowable watt densities. When high operating temperatures are needed, watt density must be limited in order not to exceed the maximum sheath temperature. Watt density is given in the specifications for each tubular heater. In general, a viscous material with low thermal conductivity requires a low watt density. Higher watt densities can be used with thinner liquids and with materials of high thermal conductivity. Premature loss of the element due to excessive temperature may result if the material’s heat-take-away ability is low. Also, the material may be charred, carbonized or its chemical makeup altered by overheating. Stocked tubulars are shipped with standard terminals, see Terminal Options in this section. Many other terminals and terminal end seals are available made to order. Tubular heaters operate at higher temperatures in a vacuum because there is no air to take away the heat. Therefore, watt densities are recommended to be 20 to 30% lower. It is recommended terminals of the element be kept outside of the vacuum. Elements can be supplied with threaded fittings for mounting thru walls of tanks, ovens, etc. Compression threaded fittings are also available for easy field installation. Rings, clips, brackets and washers can also be attached to elements for mounting purposes. To put heat where it is needed, tubular heating elements can be bent to fit most requirements. See following pages for customer bending and factory bending details. Bending should be done around a smooth round object such as a piece of pipe. For minimum bending radii, see Bending Guidelines.